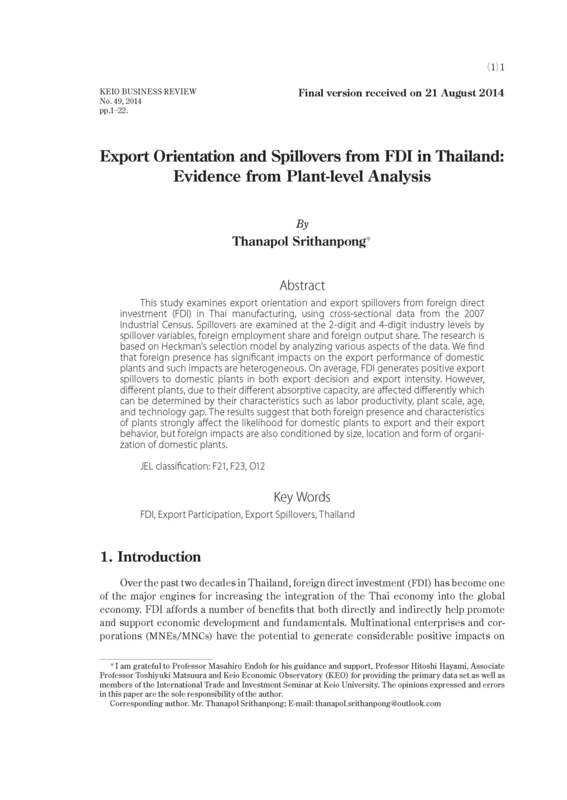 This study examines export orientation and export spillovers from foreign direct investment (FDI) in Thai manufacturing, using cross-sectional data from the 2007 Industrial Census. Spillovers are examined at the 2-digit and 4-digit industry levels by spillover variables, foreign employment share and foreign output share. The research is based on Heckman's selection model by analyzing various aspects of the data. We find that foreign presence has significant impacts on the export performance of domestic plants and such impacts are heterogeneous. On average, FDI generates positive export spillovers to domestic plants in both export decision and export intensity. However, different plants, due to their different absorptive capacity, are affected differently which can be determined by their characteristics such as labor productivity, plant scale, age, and technology gap. The results suggest that both foreign presence and characteristics of plants strongly affect the likelihood for domestic plants to export and their export behavior, but foreign impacts are also conditioned by size, location and form of organization of domestic plants.